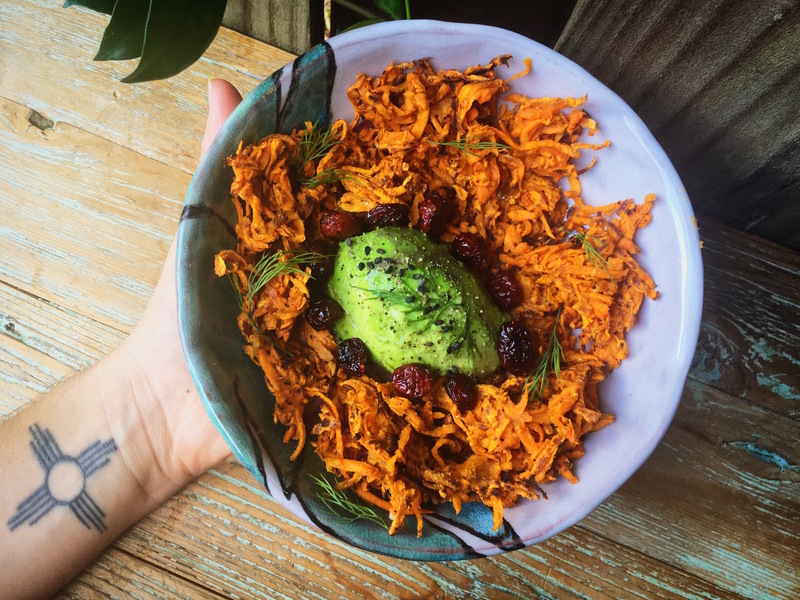 Sweet Potato Nest with Avocado "Egg"
In a big bowl, combine the flour, baking soda, old bay and salt. Mix. Add the grated sweet potatoes and toss to coat with the flour mixture. Coat your griddle (or if using a skillet, do in two batches) with olive oil. Spread all the sweet potato out with plenty of space. The more space there is between the sweet potato squiggles, the more the heat will be able to reach more sweet potato surface area making it crispy! Turn the heat onto high keeping a good eye on it. Flip when the first side is brown. While that's frying, cut an avocado in half, remove the pit, and scoop each half out with a spoon. Place the cut side down in the middle of a bowl and squeeze lemon over the top.